In the last decade or so, values and morals in our societies have diminished. The nature of living arrangements, lifestyles and the economic pressures on families have contributed to an increase in the erosion of positive values. As a result of these pressures, a vast amount of families are not spending quality time together; children are getting less personal interaction with adults but with an enormous amount of time on technology gadgets, social media and on the go TV. There is very little time to raise our younger generation with the values they need to live happy, fulfilled lives. Unfortunately our schools do not seem to be too concerned about our children’s social-emotional learning either. They appear to be more concerned with ticking target boxes for SAT exams as though this is the only determinant of a child’s success. The Value Added Parent is a community based project aimed at providing workshops and talks for small groups of children of diverse age and culture on positive values using socio-emotional learning skills by an EQ practitioner.The VAP aims to assist parents who are either extremely busy or appreciate value added help from professional trainers who can coach their kids on socio-emotional learning outside school.The VAP also aims to facilitate relevant workshops that builds positive values in the youth which positively affect their community and society in a whole (See Workshops page). My name is Abigail Adeyanju. I live in North London and I am a wife and mother of two teenage lads. I am a certified Emotional Intelligence practitioner and trainer by ‘SIX Seconds’ (The leading American EQ network), with a background in Early Years Foundation Stage Education Training and consulting. Prior to becoming a parent I believed very strongly that the sole purpose of giving birth to children was to raise excellent, well behaved, functional, intelligent kids. I also believed this came natural to all parents. I couldn’t be so far from the truth! Where did I get that idea from? Raising children comes with numerous ups, downs, headaches and heart aches. It was the most challenging job I had experienced until recently.Why do we have to deal with children pushing boundaries, mood swings, attitudes, anger, friendship issues, peer pressure, rebellion, passive aggression, sibling rivalry and so on? Very quickly I came to realize that not all children can be raised automatically as what I referred to as ‘excellent’, ‘well behaved’, and ‘functional’. It would take a parents effort, perseverance, self-control, persistence, maturity and strong will. With time I slowly accepted my role as a mother and as an emotional intelligent practitioner, coach and Early Year’s Education training experience, I have learnt to parent my children from a very different perspective. My parental conviction and passion to nurture children is the reason why The VAP was birthed in October 2013. I strongly believe that parents can raise children through positive nurturing, teaching and coaching. Our children should grow up being valuable to themselves, their immediate family, community and their society as a whole. Having met with parents from my local community in coffee shops, listening and sharing various ways, and sometimes challenges in which they experience teaching their children positive family values, if at all any; One thing is unequivocally clear to me. Due to various family pressures and work commitments, some of us barely have the luxury of time to consistently teach or instill positive values into our children. The VAP workshop was a real eye opener for me in terms of understanding how our emotions can affect our children. Also, realising that the children react with their own emotions and being able to put myself in their shoes is something I never considered previously. Abigail's delivery was very engaging and touched on a topic we seldom reflect on when dealing with our children's emotions. I learnt about refugees and how sometimes we are refugees ourselves in our daily lives. The workshop helped me empathise with others as well as inspired me. The workshop was informative and interesting. I can now relate to what refugees feel then forced out of their country. 'This was a wonderful work shop for my 7 year old daughter. If it wasn't for your workshop I probably wouldn't have known about the times she felt vulnerable. My daughter and I are even closer than we were as she has opened up more'. How compassionate is your child? does your child know the difference between compassion and empathy? 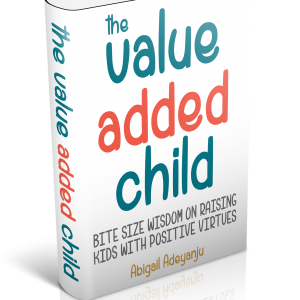 The Value Added Child is a bite size book focusing on the necessity for parents to raise and teach children with positive values at home. By ticking this box, I consent for my name and email to be used according to the terms of this website.